Learn how to make this delicate pendant using Par Puca Amos and Minos beads with matching seed beads. Please note - your beads in the materials list will make up to 5 pendants* but include a single chain for one complete necklace. Add 4 more chains to your basket to make a complete set of 5 necklaces. Please note - your beads in the materials list will make up to 5 pendants but include a single chain for one complete necklace. Add 4 more chains to your basket to make a complete set of 5 necklaces. Cut an armspan of thread and add a needle. Pick up 9 x red Amos (droplet shape) beads and 9 x copper Minos (small barrel shape) beads in alternating order. Knot the tail thread and working thread together to make a loop and thread through a few more beads to hide the knot in the beads. Exiting an Amos bead, thread back through the top hole of the same Amos bead so you have changed direction and are now threading through the hole on the wider end of the Amos bead. Pick up a copper tone Amos bead between each of these red Amos beads. Once you've added all copper amos beads around the circle, thread back through the top hole of one of the copper Amos beads so you have changed direction and are now threading through the hole on the wider end. Pick up 1 x size 15 seed bead, 1 x size 11 seed bead and 1 x size 15 seed bead. Thread through the next copper Amos bead and repeat all the way around the flower. Once you have added the sets of 3 beads around the flower, pick up 1 x size 11, 1 x size 15 and 1 x size 11 and thread through the next Amos bead again. Repeat this all the way around the flower. Your copper amos beads will start curling inwards like in the image as you pull the thread. Keep your tension as loose or as tight as you want to control this. You can secure the tension you want by creating a knot when you are happy with how far your Amos beads are standing up. 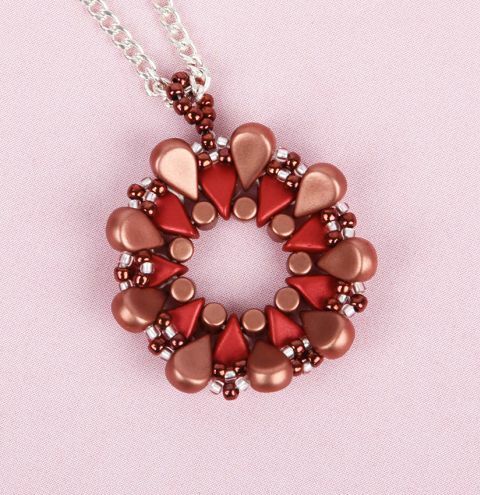 Once you have added all the seed beads around the flower, your pendant should look like this (See image). Thread around the seed beads on your flower here and around some Amos beads. Thread around the loop of 9 beads again to reinforce. Finally, pass your working thread around the design, creating knots against the main thread along the way. Weave your thread around the design until you are confident it won't unravel. Repeat this with your tail thread to secure it within your design. Add your chain through the loop on your pendant.